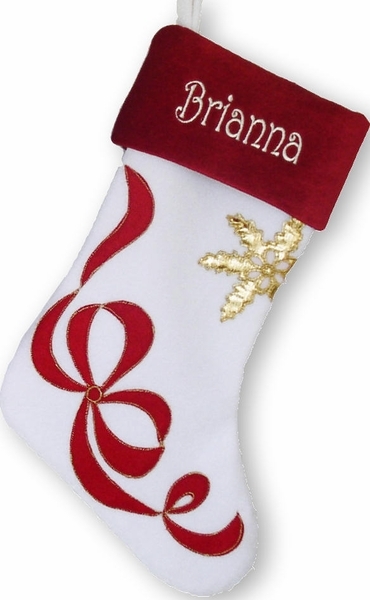 Names can be personalized on the red cuff of this Christmas stocking with gold, red metallic or silver embroidery thread to compliment the stocking design and color scheme. We have a sample picture of the stocking monogrammed with silver metallic embroidery thread ... click on the thumbnail image in the top right hand corner of this page to see a larger version. We have other complimentary designs - so you can coordinate your Christmas decorations in the same Christmas color schemes and velvet materials. MATCHING A SET YOU BOUGHT FROM US IN PAST YEARS? * The boot is shaped little differently * The velvet fabrics are similar but not identical (we depend on fabrics available on the market in the manufacturing facility) * The velvet colors do not match exactly. Our current red velvet appears to be slightly more towards purple compared to the previous years designs. * The shape of the applique star and ribbon is diffferent and the star is gold. * The embroidery in gold thread that frames the ribbon applique is different. So if you are matching set bought here last year or in 2006 / 2007 please be aware this stocking will be close but NOT EXACT match to this year's model. Measurements: Measured along the diagonal from the top left hand corner to the toe, the stocking measures 18 inches, and the width along the cuff is 7.5 inches. The inside of the stocking is fully lined. Materials and Design: The body and cuff of this Christmas stocking is made out of velvet and the applique ribbon is constructed out or non woven material matching the color of the cuff. The applique star is gold metallic synthethic material and appliques are framed in metallic gold embroidery thread. The inside lining is in matching color polyester. The stocking is also padded inside between the lining and the exterior velvet, which gives the stocking soft feel, it holds its shape very nicely - just a superior quality workmanship! Lining: Yes, this Christmas stocking is lined inside with fine polyester material that matches the color of the stocking.